Paul Hunt's Domestic Electricians can provide full consultancy and guide you through the technical and legislative issues to ensure that the electrical installation meets all compliance requirements. Whether you are making home improvements or a landlord of a property, electrics are an essential consideration for safety and legal reasons. Firstly, the safety of you and your family is paramount. It is important to ensure you are free from electrical hazards and reduce the risk of any potential electrical dangers. Since 2005, all domestic electrical work must comply with part ‘P’ of Building Regulations. Part ‘P’ refers to legislation that ensures domestic electrics meet with current health and safety requirements. 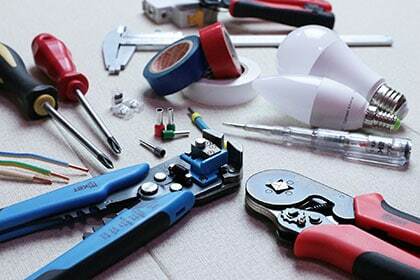 In order to comply, all electrical work must be carried out or tested by registered domestic electricians. Consequently, this has practical implications when it comes to selling or renting out your property, or purchasing building insurance. The owner of a property is ultimately responsible for ensuring their home complies with Building Regulations. Local authorities can force owners to remove or alter work that does not meet building regulations. Essentially, the best way to ensure you are compliant is to use a registered electrician and retain your certified paperwork. At Paul Hunt Electrical Installations, all of our contractors are certified to carry out the design, installation and testing of electrical works in your home and garden. Moreover, we are certified by the NICEIC specification of training, the ‘National Inspection Council for Electrical Installation Contracting’. The NICEIC is a Government approved scheme and is often favoured by Local Authorities. Our engineers provide testing and inspection of electrical installations as an essential part of ensuring compliance with the Electricity at Work Regulations 1989. In addition, we ensure that all electrical installations meet the UK National Standards (BS 7671). Overall, your certificates give you the security that your electrics are compliant and you hold the necessary evidence. Another advantage is that our team handle the entire process from inspection, installation and testing. With one of our experienced contractors, you can feel safe in the hands of a specialist.